Before starting my indie skincare company, I enrolled in a certification program at a small aromatherapy school in New York City’s East Village. I was aware of the rise of natural and small-batch beauty based on my extensive experience as a trend consultant, but from a more personal perspective growing up in the Bay Area with a progressive family, I knew essential oils were undeniably delicious smelling and full of beneficial properties. Six months after the course, I was able to link this knowledge together and build the concept of what became my brand, Esker. I’d learned about the botany, chemistry and skincare benefits of plants like lavender, eucalyptus and geranium, and I knew I wanted to create products around these incredible ingredients, while also honoring them. There’s a lot of confusion and murky information about essential oils, so my aim is to bring clarity to the conversation and show how truly functional they can be. Essential oils are as diverse as herbs and each comes from a different plant with a completely unique composition, aroma and skincare benefit. As I began to imagine bringing my natural body-care line to life, I spent a lot of time considering these plant ingredients and what goes into harvesting and producing them. I want to make people think more deeply about plant life and a key part of that is acknowledging and appreciating the role of pollinators like bees, butterflies and birds in the ecosystem. The more I read about protecting pollinators, whose population is decreasing due to urbanization and pollution, the more I understood how helping them could actually be quite simple—we need to plant more flowers! I love the simplicity of this solution and I wanted to make it very easy and fun for my customers as well, so I created a custom seed packet to accompany my product boxes for an extra little surprise. 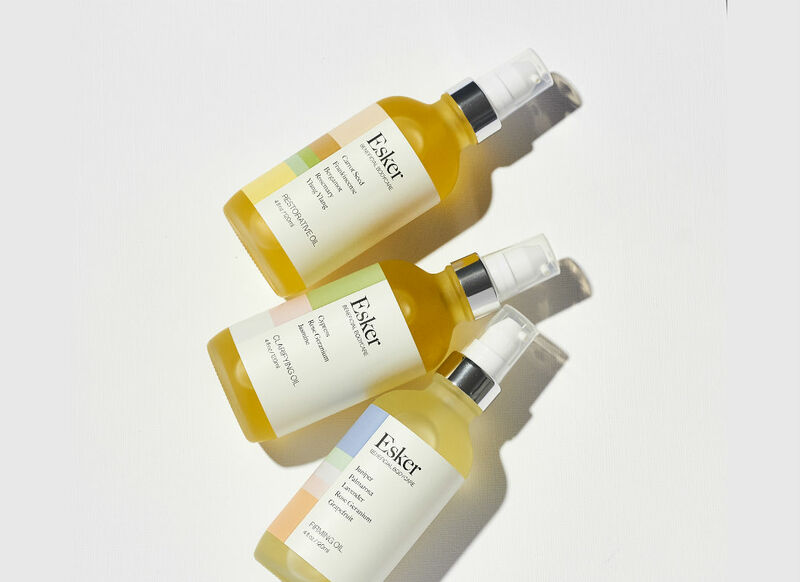 Esker now has six available products: three body oils and three natural bodywashes. Each formula combines essential oils and incredibly nutritive base oils like fractionated coconut oil, squalane, avocado, evening primrose and jojoba oils, which are chosen to be highly moisturizing, but not at all greasy. In addition to the opportunity to work with amazing retailers like Goop, Jenni Kayne and Anthropologie, the best part of running Esker is meeting other entrepreneurs creating their companies with a sense of mindful- ness. Hopefully my products will help everyone slow down, take a moment to participate in a relaxing ritual, and of course, plant more flowers.